Do you want to prepare a totally healthy healthy, raw snack in 5 minutes that's transportable? Yes??! Well ok then..... let's get going making tasty, inexpensive protein balls! 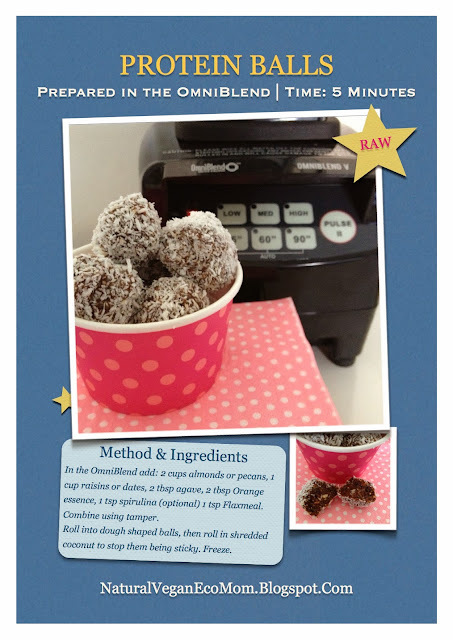 I used the OmniBlend to makke the dough in under a minute- it is fantastic for creating raw food.... don't forget to check here for a discount code too! I'm salivating on my work break here !!!! Delish! Those look yummy !!!!! How long will they keep for ? I saw your chick pea video on Instagram ! wOw? I thought it was amazing , can you make other flours ? Like rice , coconut etc?